Using Botox and fillers together is an amazing combination, the Botox will relax the muscles and the fillers will fill the lost volume at the dermal plane. 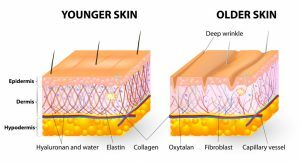 As shown in the diagram, as our skin age, it loses its elasticity along with the volume. The specific location of the wrinkles is related to the anatomical composition of the area. Usually, wrinkles occur according to the muscle contraction and relaxation orientation. The repetitive movement of the mentalis muscle in the front head as we express our emotions daily along with the aging factors result in wrinkles. Think of our skin as a paper, if w fold it and straighten it, then fold it and straighten it again over 30 years couple of time a day, the hinges of the folds will become permanent, and even if you try to straighten the paper, you will not be able. Our skin has a compensation mechanism, this mechanism gets less efficient over time. The concept behind using Botox injection in the forehead is to relax the mentalis muscle so to stop repeating “the folding process”. 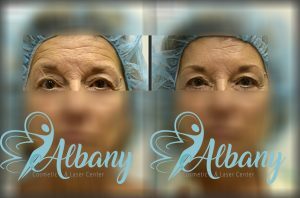 Using the fillers at the dermal plane helps to fill the volume lose under the wrinkle. Using Botox is really effective in early stages when the wrinkles are dynamic (wrinkles appear only when the muscle contract and we show expressions), but once the wrinkles are turned into static (they always appears regardless of muscle status) then fillers are needed. Using Botox in early stage help to stop wrinkles advancing from dynamic to static. 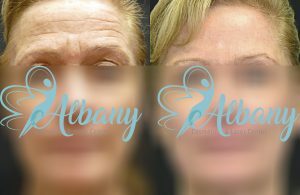 As you can see, using botox along with fillers will help skin tightening on the forehead and erasing some years from you face. 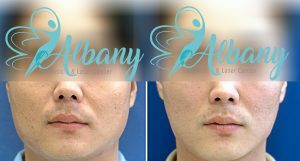 Other uses of Botox is face-slimming, injection Botox into the masseter muscle results in the face feature to be all pulled up in a V shape. It is important to take care of your skin to avoid the formation of deep static wrinkles. This includes continuous moisturizing, chemical and laser peels, using sunscreen and avoid tanning.